Home | Articles | Microsoft | Windows 10 | Wondering Where Startup Folder Went in Windows 10? Here is How to Find it. With the recent migration to Windows 10, there have been a lot of little things that people either can’t find or can’t seem to figure out. With my recent transition to Windows 10 on all computers in the COD household, these little annoyances keep popping up. The first one that popped up was on my Home Theater PC. The system had previously been running Windows Media Center on Windows 7 and now runs Kodi exclusively on Windows 10. With that said, having Kodi startup automatically under Windows 7 was easy. All I had to do was copy a shortcut to the startup folder and force it to delay so Kodi wouldn’t start before networking did. 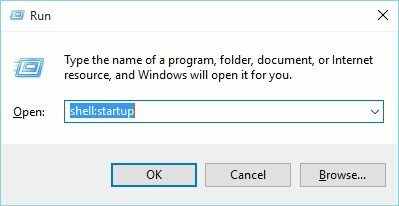 Although there are plenty of things I like about Windows 10, not knowing where the startup folder is seems to be one item on the list of things I miss about Windows 7. Luckily, there is an easy way to find the Startup folder. Click WIN +R (hold down the windows button and press R) to bring up the Run Dialogue box.